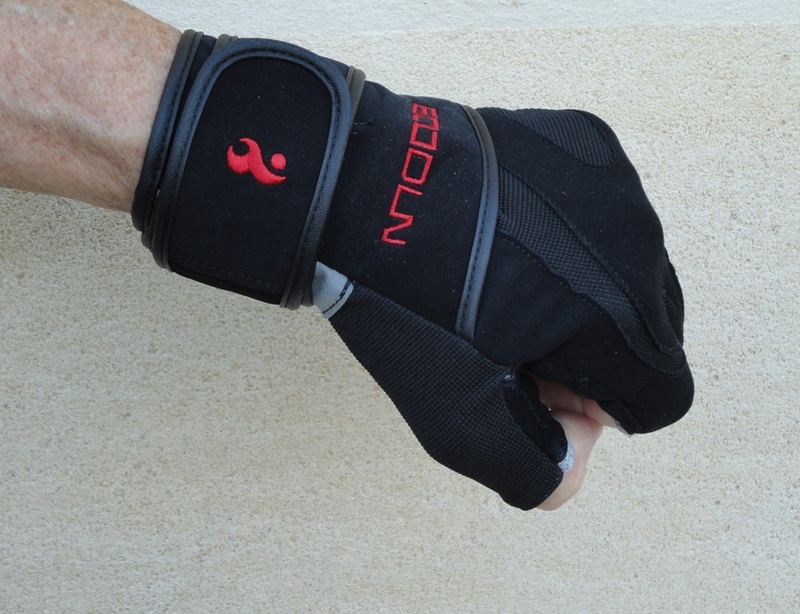 Out of the selection of gym gloves on this page, my review is for the Second Generation Scarlet gloves. 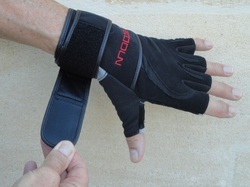 A sample pair was sent to me for test and evaluation, and I asked my husband to use them for his workout sessions. After a few weeks of use, here are his observations. First of all the sizing: having looked at the chart and measured his hands, we asked for a size Large. 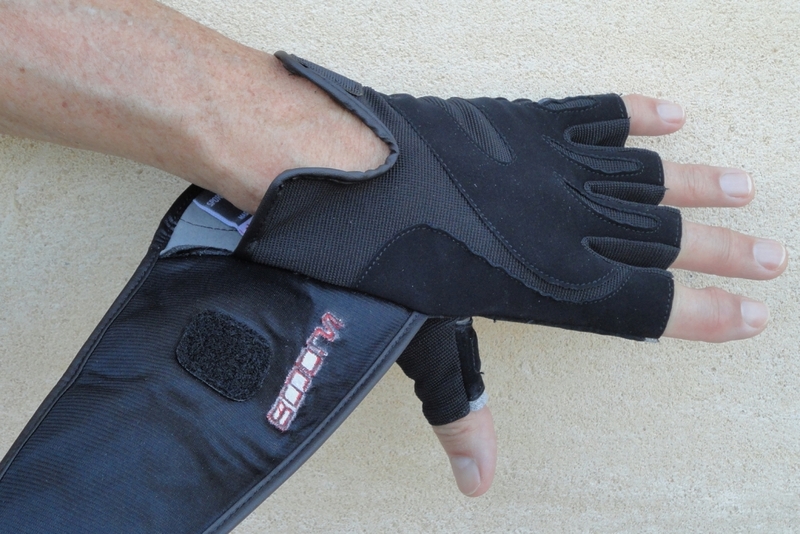 They fit like … gloves, which is great because these are accessories that work best when the fit is correct. They are quite complicated in construction with different layers for different purposes. 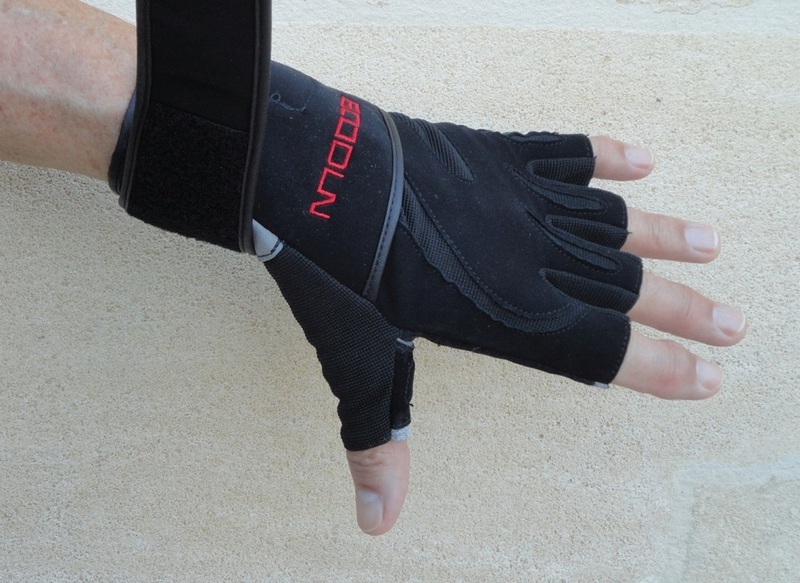 As the person using them, all you need to know is that they are well made, comfortable to wear and give protection and support to the hand and joints, but it's interesting to me to read about how they're made. The obvious use is for lifting weights, both dumbbells and barbells. 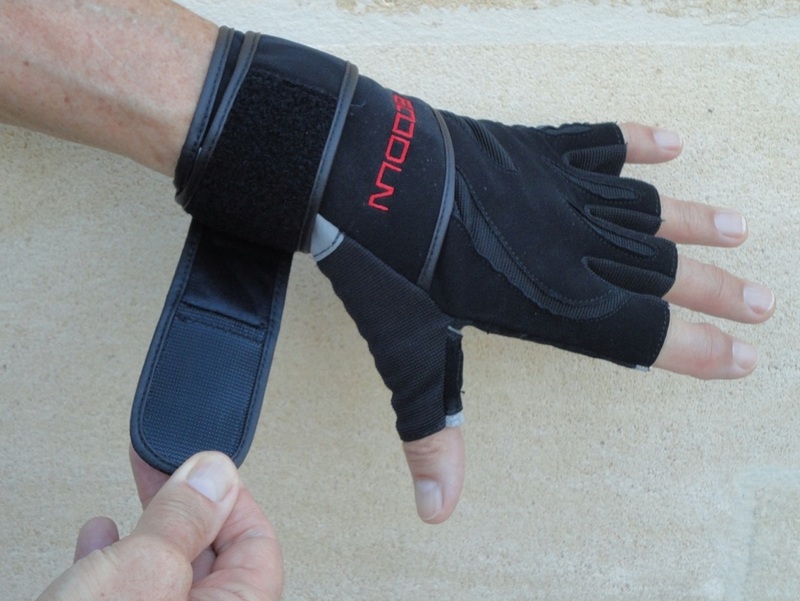 The gloves perform brilliantly here, offering good grip, some cushioning for the palms and finger joints, and the added bonus of the wrist strap support to stabilize and assist the wrist when under stress. Another excellent application is when doing press-ups. The glove protects hands while the wrist support comes into play at full extension, when the weight of the upper body is being borne by the hands and wrists. 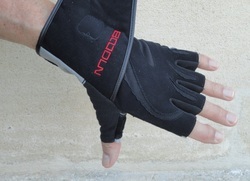 They also work great on all the usual gym machines and pulleys, giving protection from calluses and abrasion. 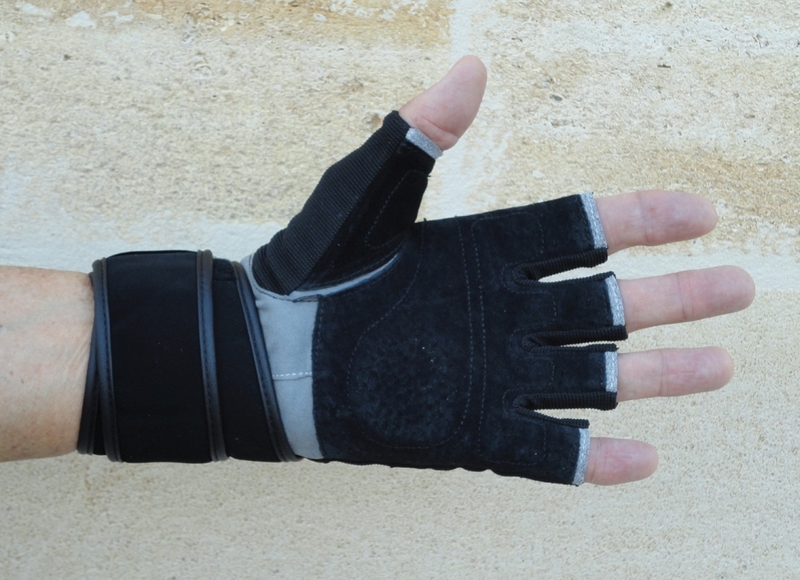 The complex structure ensures that the fingers retain their mobility, while the parts of the hand that need protection are covered. All you need to do is try them a couple of times to realize their value. Based on his use so far, my husband feels that they are very comfortable, strongly made and appear very durable. Read my review on Amazon. These workout leggings were furnished for an independent evaluation and have become a welcome addition to my husband's collection of compression garments. We try to exercise every day and since I started to wear my own compression leggings, I have noticed a significant difference in the ease of my workouts. 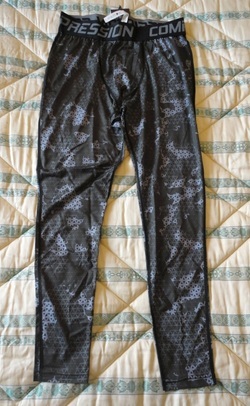 My hubby confirms that these leggings have the same beneficial effects. According to the label, the fabric is a blend of 86% Polyester and 14% Elastane (also known as Spandex or Lycra). 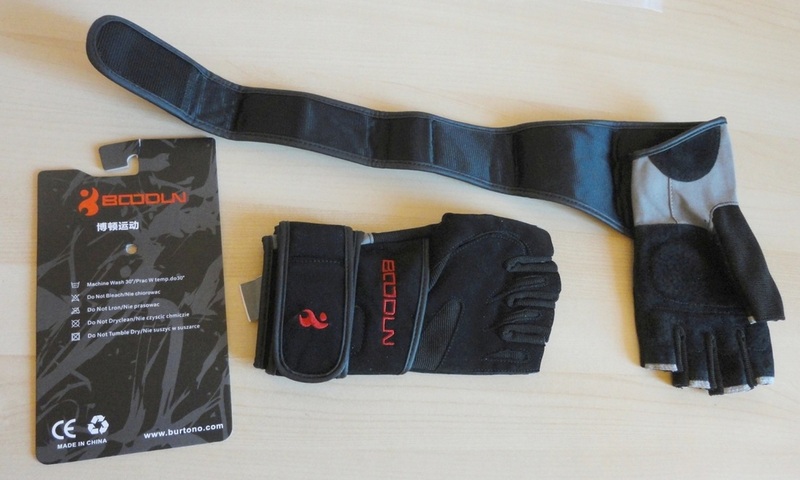 It feels very silky and comfortable on the skin, both during and after exercise. Sweat is wicked away and the leggings are thin enough to become a second skin. 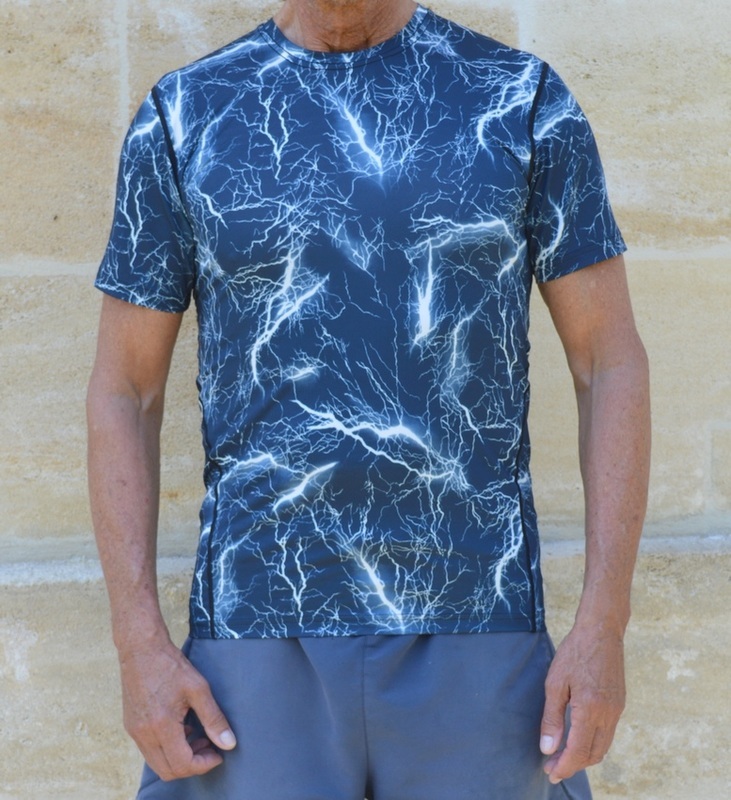 They are intended to be worn under your regular workout clothing, but the very original printed designs will make you want to show them off! 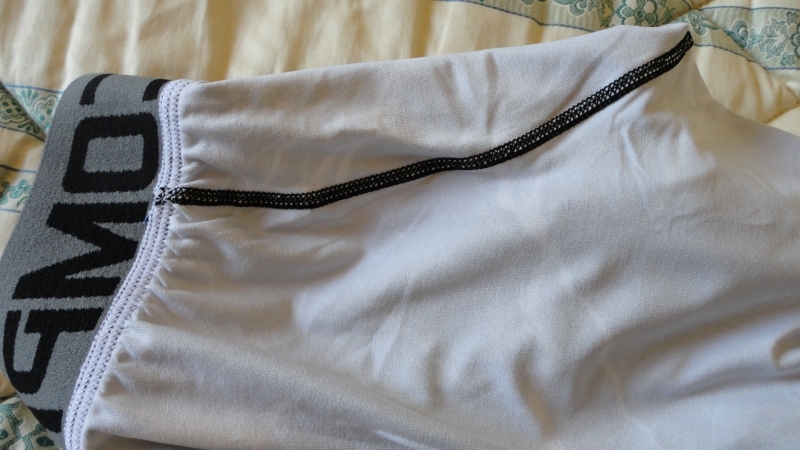 Manufacturing quality is high, all seams are tight and flat and my hubby particularly likes the deep waistband which stays comfortably in place during even vigorous activity. I should add that the leggings wash well and dry quickly on the line. This type of fabric is damaged by heat, so you should stick to a cool 30 degree wash and tumble dry (if you must). Size, always the big question mark, is not a problem with this brand. You can trust their size guide (under Product Description) to be accurate. So pick your size and when you go to order, disregard the inches equivalent in the drop-down box. My hubby's legs are long and particularly slim (from his swimming days); his waist measurement of 32 inches, or 81 cm, fell between sizes. For this style (lightweight compression) we asked for a size Medium. It fits him perfectly, although he could have used an inch more in length. However, if your legs are chunkier, the vertical stretch will take care of that more effectively. 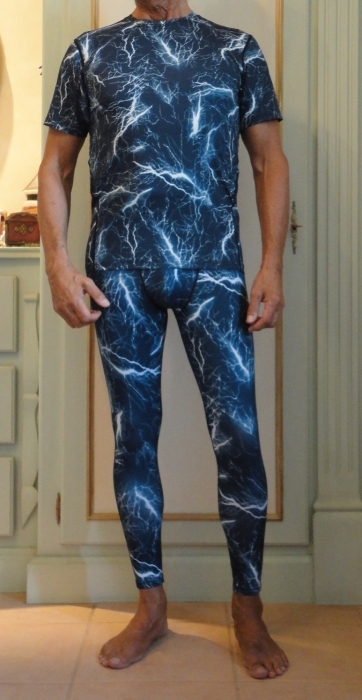 Although not completely happy about it, he allowed me to take and post photos of the leggings, worn here with a matching Thunder compression top. I think they look great, but then I would, wouldn't I? Essentially, as my doctor explained, when you wear compression garments, your circulation becomes more efficient, your muscles warm up and cool down more quickly, and there is a reduced chance of injury because your muscle mass is subtly balanced and contained. The moderate compression also helps keep muscles from tiring and acts a little like a pump, circulating blood and the oxygen it carries more actively. Thermal balancing also means that sweating is greatly reduced due to the fabric's ability to wick away moisture. The obvious result is that one's workout is easier, less stressful and more comfortable because of the temperature regulation. Size, always the big question mark, has not been a problem with this brand. The Product Description for this style lacks guidance, so I hope you can get some idea from our experience. My hubby's legs are long and particularly slim (from his swimming days); his waist measurement of 32 inches, or 81 cm, fell between sizes. 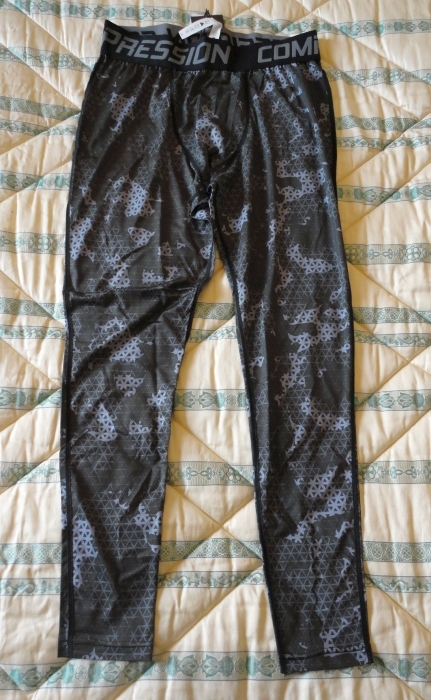 For this style (medium weight compression) we asked for a size Large and the fit is just about perfect lengthwise, although the compression is less than ideal. So if your waist is the same and your legs are similar to what you see in my photos, you might want to go with a smaller size (Medium); otherwise size Large will probably be better. 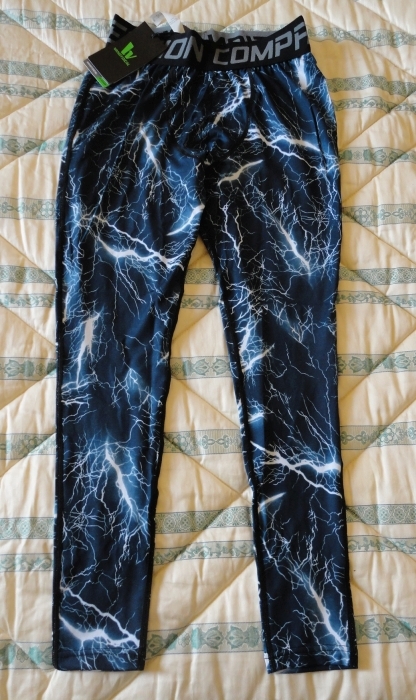 Although not completely happy about it, my husband was game enough to allow me to take and post photos of the leggings, which are very much as shown on the product photos. I think they look good and, most importantly, in the correct size they provide the benefit of moderate compression while working out. A well-fitting, really comfortable, silky exercise top with the added advantage of some compression. My husband has a well-developed upper body for his build, a consequence of his early swimming career. When I was offered this item to evaluate and review, it took a little consultation with the vendor to arrive at the correct size, and I have to say that I was really impressed with the help and attention we received. So, to give you an idea of size and fit, based on his chest measurement of 42 inches (107 cm) and waist of 33 inches (84 cm) we settled on an XL size and while the top fits my husband well over the shoulders and chest, it is a little loose at the waist (see photos). So if you are in between sizes and looking for effective compression, you might want to try a size smaller than what you see on the chart. 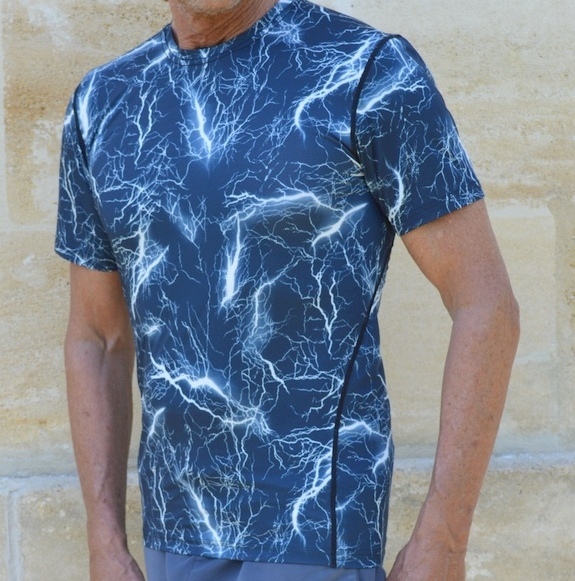 The fabric is extremely silky and comfortable on the skin, both during and after exercise. Sweat is wicked away and the top is light enough not to get in the way of vigorous weight lifting or other athletic activity. 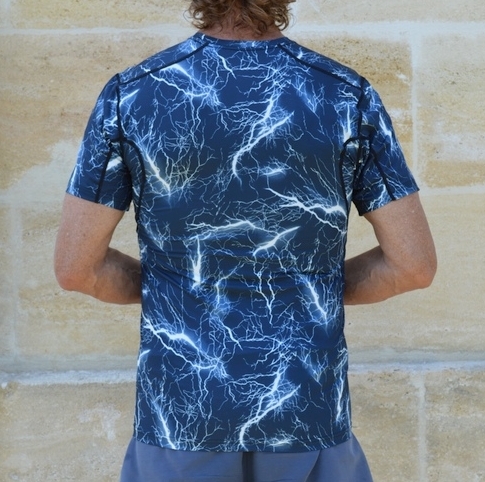 There are many patterns and colours to choose from, but we could not pass up the drama of Thunder. In person, the pattern is really eye-catching and the colours saturated and quite beautiful. The quality of manufacture and stitching are excellent and the pricing very attractive, especially in comparison with the "big brands". Silky and very comfortable boxer shorts for men who wish to wear a compression garment during athletic exercise. 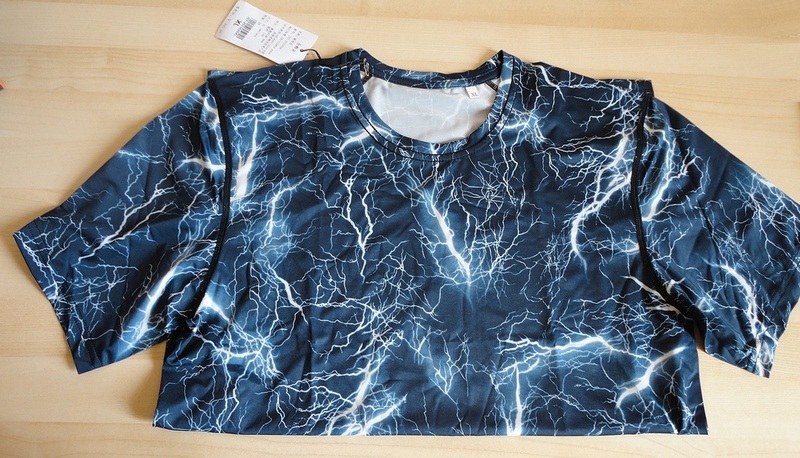 We were asked by the vendor to try out and review this garment. 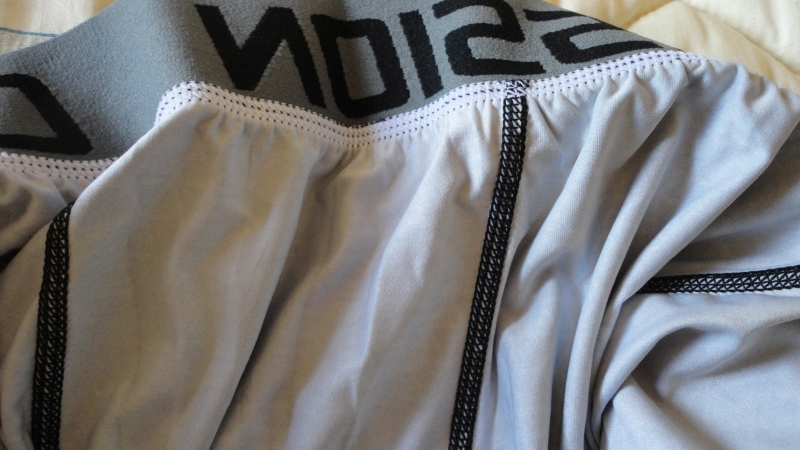 Due to a mix-up with the sizes, we received an XXL which is way too big for my husband (who has a 33-inch waist) so we cannot comment on the compression aspect, but in all other respects these shorts are very, very comfortable, even in the recent heatwave. The elastic band is wide but non irritating on bare skin. All seams are flat and reinforced, with no loose threads or visible imperfections. 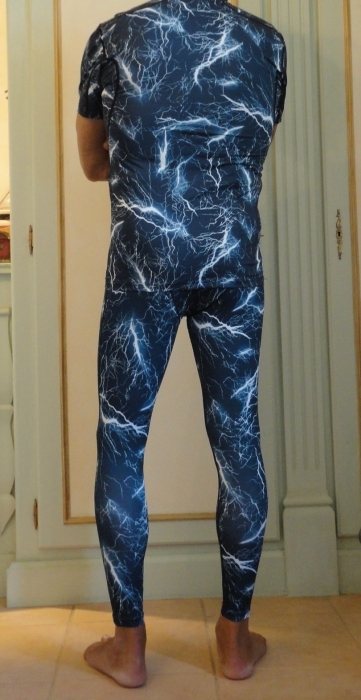 The fabric (a Polyester/Spandex blend) disperses heat and sweat effectively and has good multi-directional stretch. The medium long length is a good compromise as it does not cut into the upper thigh and does not appear to ride up, despite the fact that they are much larger than they should be. I believe the vendor has now updated the size chart to be more accurate, but if in doubt, do ask for assistance. The customer service is very attentive and responsive to feedback. A word about the design. These are eye-catching and stylish items of underwear. Out of the many colours and patterns available (and more on the way, I believe), we chose the Dark Blue model. It looks exactly as in the photo, with saturated colours and a crisp printed motif.